BentoLunch.net - What's for lunch at our house: One Option for Apples in Bento! One Option for Apples in Bento! F&B are on an apple kick lately, but I find that if I don't slice the apples, they waste too much of them. Besides dipping the slices in Sprite, this idea I found on Pinterest seems to do the trick rather nicely--slice the apple in to thirds, piece it back together, slice in thirds again, like a tic tac toe cut, piece it back together and hold it with a rubber band. Unlike Pinterest, I don't quite slice mine all the way through, leaving a fraction of an inch at the bottom so that it's easier to put the apple back together and rubber band it. It's such a little bit uncut that the kids can easily break the last part on their own, and they are trained to bring home the rubber bands, of course! 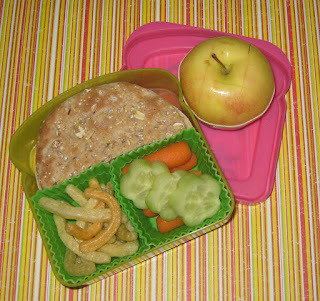 This would be Faith's lunch, but both kids had the same--turkey & cheese sandwiches on multigrain rounds, carrots sticks and cucumber flowers, a few veggie straws, and a rubber banded apple. I was pressed for time, so no cute sandwich toppers today. What a great idea! John loves apples but, again, if sent with a whole one he might take a couple of bites and then chuck the rest rather than bring it home to be salvaged in some way. I'll have to give this a try!